If you can provide those three items in all conference rooms, you can achieve the natural, immersive sound quality that your HD video conference system is capable of. The HVAC noise in the conference room should be less than 30 dBA or Noise Criteria (NC) 25. Most building HVAC systems will exceed this level unless care is taken to add lined duct, locate equipment away from the room, and use low air velocities. Many conference rooms have a glass wall looking outside or into a corridor or lobby area. Intruding noises like traffic or people talking outside the room can interfere with the conference too. Some conference areas are not even divided from the rest of the open office area, which is not a good idea for video conferencing. An ideal conference room should have a reverberation time around 0.5 seconds. This is not possible in a room with a lot of hard surfaces like glass, drywall, concrete, or exposed metal deck. A reverberant room makes speech sound muddy and makes the background noise louder. Soft, sound absorbing materials are needed to control reverberation, and they should be distributed around the walls and on the ceiling. This doesn’t mean that your conference room has to have a lay-in tile ceiling and fabric-wrapped rectangular acoustical panels on the walls. Acoustical treatments can be beautiful too. Take a look at our Pinterest boards for ideas like acoustical plaster, microperforated wood, perforated gypsum board, stretched fabric, and other unique treatments. According to the old adage, children should be seen and not heard. Microphones are the opposite. No one wants to see them, but unfortunately to be heard well they usually need to be seen too. For optimum audio quality, each person should have their own gooseneck microphone. There are wireless goosenecks available with rechargeable batteries, so they can be stored in a cabinet and placed on the table as needed with no unsightly wires or cutouts in the table. The next best option is probably to use a tabletop microphone, but they have limitations. They are usually farther away from the person speaking, they can be blocked by a laptop on the table, and shuffling papers on the table near the microphone creates noise. Another good option is a beamforming microphone array, which uses multiple microphones and advanced processing to isolate the person talking from the other noise in the room as much as possible. 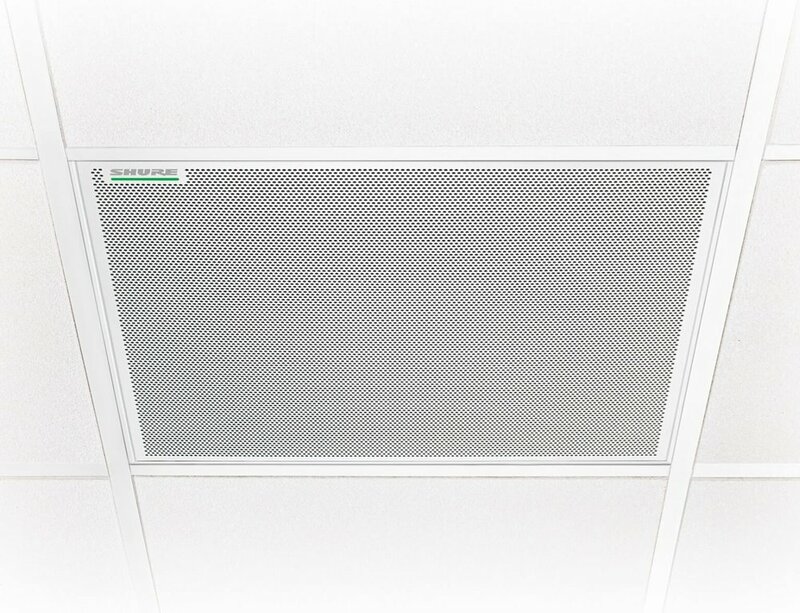 Examples include the ClearOne Beamforming Microphone Array or the recently announced Microflex Advance from Shure which can replace a 2x2 ceiling tile. The microphone array can be mounted on the table, in the ceiling, or suspended from the ceiling. Either way, closer to the talker is better. 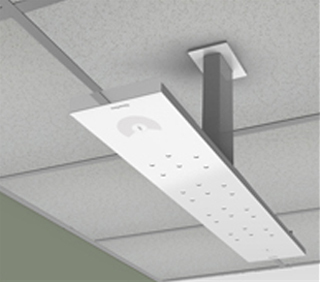 Avoid using individual microphones suspended from the ceiling or mounted directly in the ceiling tiles. This option puts the microphone farthest from the talker and creates the worst signal-to-noise ratio.